Large deck off the bedrooms. Walk across the street to the beach! 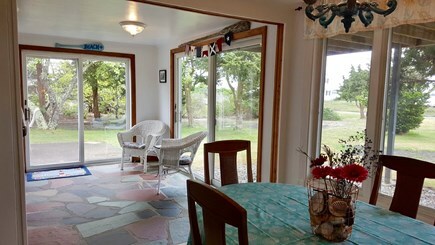 Enjoy meals on the patio overlooking Lewis Bay..
View from dining room into the kitchen. Living/dining room with views of water. Beautiful large master bedroom with ocean views and breeze. Queen bedroom with direct deck access and water views. Over a half acre of pivacy which abuts forever wild land. 70 ft to this quiet beach. Walk 2 blocks to 2 other larger ones! 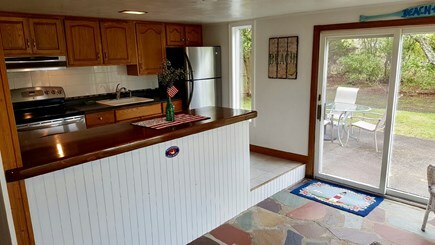 Beach: 70 feet to private beach, short walk to others. Gorgeous Lewis Bay views and easy water access from this very private, 1200 square foot cottage. Enjoy the warm water of the bay from the private neigborhood beach in front of the house. Take a walk to the boat ramp, beach and playground around the corner, or bike 7-10 minutes to Seagull beach. This is a perfect spot to bring or rent your kayak. You can put it indirectly across the street. This property is located in a quiet,family friendly, walking and biking neighborhood. Here you can enjoy the many a ctivities of a Cape Cod summer. At the end of the day, rinse off the salt in the outdoor hot/cold shower, then grill on the side patio while watching the sunset on the water, or relax in the evening breeze and watch the boats traveling to and from the Islands of Nantucket and Martha's Vineyard from the deck off of the upstairs bedroom. Relax to water views and ocean breezes from two of the upstairs bedrooms which includes the master. Water views from living room, kitchen, patio and front yard. Enjoy the privacy of a property that is bordered by forever wild land filled with songbirds. Experience front row views of July 4th fireworks over the bay directly in front. Close to the centers of Hyannis and Yarmouth, minutes from Rt 28 and all attractions, restaurants and conveniences, but far from the noise and traffic, this is the ideal hideaway for your family's relaxing vacation. Great central Cape location with easy travel to other Cape destinations. Quick access to Rt 6A and 6. Two minutes from nearest restaurant/bar. Minutes to grocery stores, pharmacies, museums and shops. Easy access to ferries for the Vineyard and Nantucket. If you wish to finance your vacation with us we now accept PayPal Payments. This way you can choose to use your favorite credit card, debit card or make a direct payment from your account. ***Please note that linens are not included. We do provide pillows and bedspreads. You can bring your own towels and sheets or contact a local linen service that will deliver to the door for you (auntievis.com). Security deposit of $400. Will be refunded provided no damage. If you arrange to bring a pet there is a $200 non-refundable pet fee. Nearest beach: 70 feet to private beach, short walk to others. Additional availability info: Discounts may be offered for more than one week stays. This is a Saturday to Saturday vacation rental. Additional pricing info: If you have arranged to bring your pet there is a $ 200 non-refundable pet fee. State and local taxes of 14.45% will apply. What a wonderful stroke of luck! This cottage was wonderful, fulfilling all of our expectations. It is beautifully situated, only some 70 feet from the beach. One can very easily go kayaking and swimming, which we did. There is also an outdoor shower, a patio and an excellent gas grill for grilling. The inside of the house is very tastefully decorated, with 3 bedrooms and very comfortable beds, for example, a super king size and queen size bed. Our stay of 2 weeks was also enriched by my daughter, son-in -law and lovely 6 month old granddaughter visiting us for 5-6 days. We would again like to thank the owners for sharing their lovely cottage with us. We hope to come back soon! We were very happy with this location. Exactly as the pictures show and great access to the beach. House was clean and well appointed with everything you need. Owners were very responsive and nice to deal with. We will be back! This is one of those gems you know exist but can never find — a quiet, friendly neighborhood right on the water without the traffic and noise. The place was spotless. Great views. Only 5-minute drive for food and supplies. Owners were very accommodating and pleasant. We'll definitely be back. Our family takes special pride in our properties and has a 30 year history of rentals. This property is new to us and we are excited having just completed major updates. 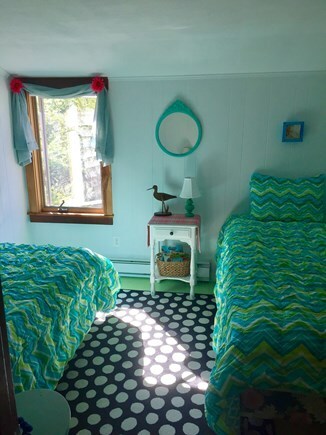 The property has had a long history of summer rentals, but was rented mostly by word of mouth in the past. Therefore, it has just a few reviews to date. That is quickly changing as our guests are having great stays and are starting to fill up our review box! Thank you for your kind complements!! The views, water access and convience make this an amazing location. The picturesque sunsets and easy boat launching on the bay. The friendly, quiet neighborhood with easy access to anything on the Cape. Located in a neighborhood of few rentals and mostly quaint summer homes. Fantastic walking and biking throughout neighborhood streets. Steps to a small private beach which is perfect for children. Brief walk to larger beach, boat launch and playground. The warm waters of Lewis Bay which are typically in high 70-80 range and make swimming truly enjoyable. West Yarmouth and Yarmouth have a plethora of attractions. Museums, mini golf, children's activity centers, restaurants and shopping abound. Hyannis which is the town next door is minutes away and hosts restaurants, museums, shopping, fishing and, boat trips. The ferries to Martha's Vineyard and Nantucket are located in Hyannis Harbor. This property is minutes from all the activities any family or group would need yet nestled in a small, relaxing seaside neighborhood.